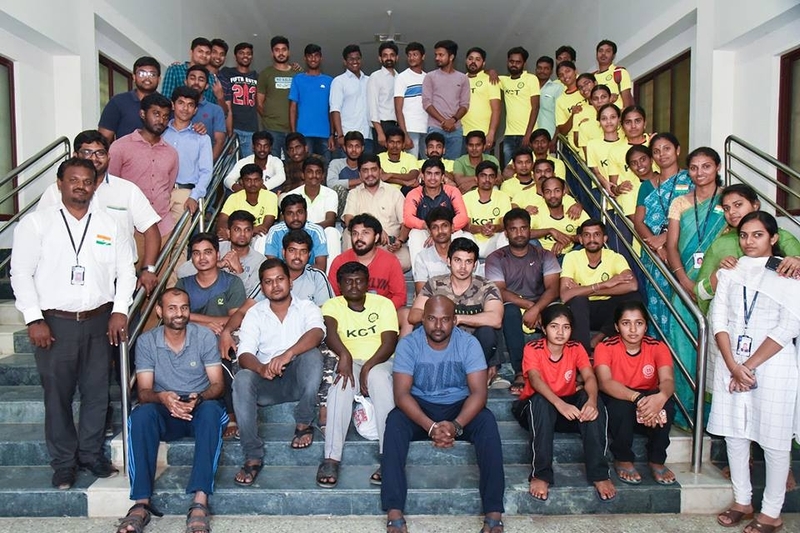 The KCT Alumni Sports Meet was held on 26-01-2019 & 27-01-2019, with great zeal, excitement and frolicsome atmosphere. More than 70 alumni from batches 2010 to 2018 turned up to compete with their fellow mates in Basketball, Cricket, Kho-Kho, Handball, Hockey, Kabaddi & Football. The Alumni gathered in Swami Vivekananda hall for the inauguration. The programme began with the welcome address by Mr. Nithin (Sports coordinator). Followed by this, Mr. Sooriya Pragash - Manager, Alumni Relations welcomed the alumni and addressed about the alumni activities. Mr. Valliappan (Sports coordinator), elaborated the Sports achievements done by our students in this academic year. The special address was given by our Joint Correspondent, Shri. Shankar Vanavarayar. He welcomed the alumni and was keen to know their life & happenings after college.